Is Your Portable Water Filter a Cheap & Dangerous Overseas Knock-Off? 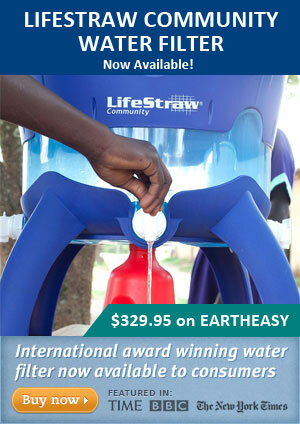 Lifestraw Community Water Filter Now Available! Water Filters in the Back-Country? Double up or Take Lots of Spare Parts! You could call this the Big Brother of the Lifesaver Bottle. Where the bottle has some flaws and weaknesses, the Lifesaver Jerrycan is without any issues and produces clean good tasting water. With a capacity of 18.5 liters and the ability to filter out all particles over 0.015 microns you can be sure it will remove all bacteria, viruses, cysts, parasites, fungi and all other microbiological waterborne pathogens. This is one of my favorite pieces of equipment in my preppers stockpile! 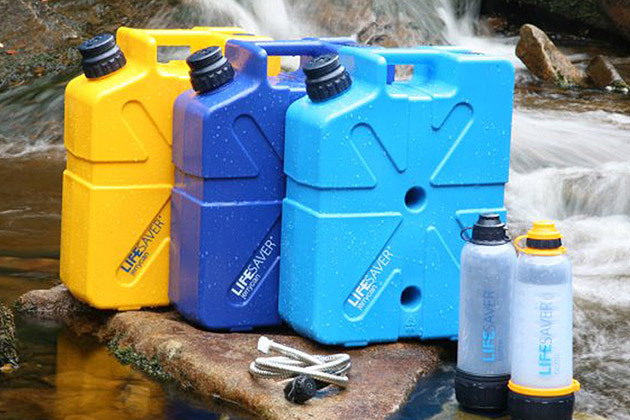 There is no other water filter like the Lifesaver Jerrycan on the market. It filters out all bacteria, viruses, cysts, parasites, fungi and all other microbiological waterborne pathogens to .015 microns. It will hold up to 5 gallons of water that can be filtered as required. The technology used in the Lifesaver Jerrycan is identical to the Lifesaver Bottle and it uses pressure to push water through the filters in the same way. However, this is where the similarities end, in my opinion, the Jerrycan is a much better product and much more capable than the Lifesaver Bottle. It is a very solid unit and looks like it will stand up to a reasonable amount of abuse. What I really like about the Lifesaver Jerrycan is the capacity, you can fill it up with dirty water, take it back to wherever you are located and then use water only as needed. This provides water storage and filtration in one product – no other portable water filters I know of can do this. The Lifesaver Jerrycan is a perfect addition to any survival/preparedness kit. One Lifesaver Jerrycan 20000 will provide a family of 4 with clean safe drinking, cooking and washing water for over 1 year! Although there are no close up shots in this video, and it is not professional, it is the best Youtube video currently available that demonstrates the Lifesaver Jerrycan. Although the Lifesaver Jerrycan uses leading edge technology, it is not complicated. You can see in the diagram below that parts are easy to remove and replace as needed. As you can see, the overall design is very well thought out. Indentations and shape are designed for strength and rigid structure. The filter and pump simply screw out and the inlet and outlet are far enough apart to prevent cross contamination. The filter/tap head is recessed into the Jerrycan to prevent breakage. It will remove all bacteria, viruses, cysts, parasites, fungi and all other microbiological waterborne pathogens from dirty water, including that contaminated with sewage. This makes it ideal for use in Third World Countries or any area where water quality is very questionable. The initial flow rate (new) is 2 liters a minute (about 1/2 gallon) but will slow over time – how much and how fast will depend largely on the quality of water being filtered. The worse it is, the faster the flow rate will diminish. The Lifesaver Jerrycan is without any issues that I could find and produces clean good tasting water. With a capacity of 18.5 liters and the ability to filter out all particles over 0.015 microns you can be sure it will remove all bacteria, viruses, cysts, parasites, fungi and all other microbiological waterborne pathogens. In some videos you will see people place the Jerrycan on its edge with the tap facing down. If you do this without drying off the area where you fill the Jerrycan, contaminated water could drip down to where you are filling cups or other containers and drip into your clean sterile water, make sure this area is dry before tipping the Jerrycan on its edge. 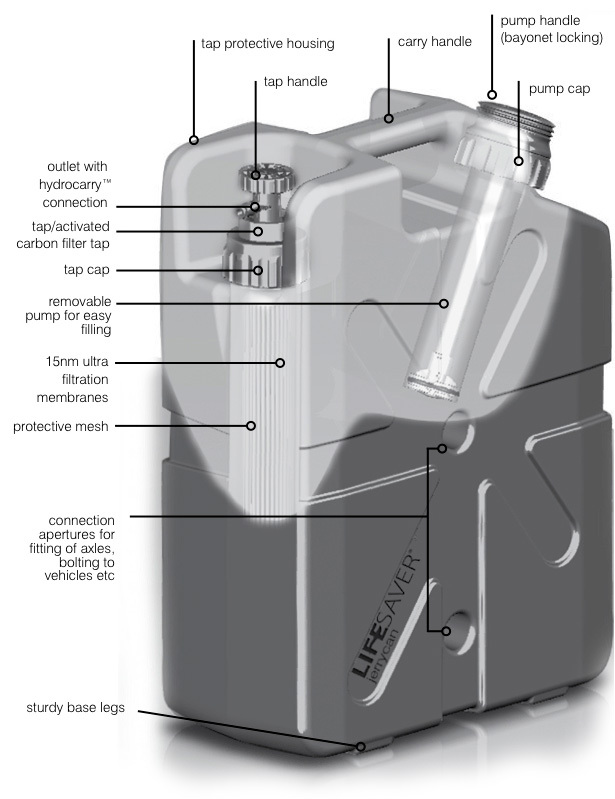 Overall, the Lifesaver Jerrycan is an amazing product and sure to save many lives in the world, maybe even yours. I am sure you will not be disappointed with it. I give it 5 stars all around! 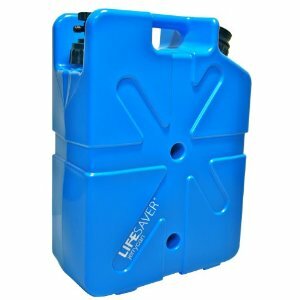 Currently there are not to many places you can buy the Lifesaver Jerrycan. Amazon seems to be your best bet for pricing and stock. Henry Reinders is a moderate prepper with interests in water conservation, environmental protection and sustainable living. Henry brings over 30 years experience as a renovation & building contractor, gardener, part time inventor and avid outdoorsman. I've done a lot of research on water filters... and the #1 conclusion I have come to is that no water filter on its own is 100% safe against all viruses and other dangerous contaminants. To be 100% sure your water is safe to drink when backpacking, I recommend using a durable water filter like the Katadyn Pocket Micro Filter followed up with a UV sterilization using the SteriPEN Defender. For higher volumes of water where no power is available, The New Lifestraw Family 1.0 offers the best protection and ideal for use in any location! Vestergaard Frandsen is an international company dedicated to improving the health of vulnerable people, most of whom live in developing countries. 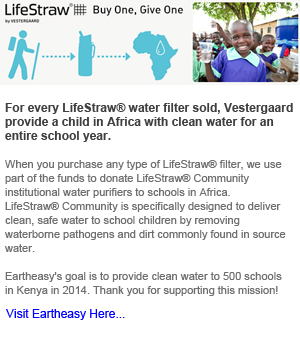 They have donated 900,000 Lifestraw Family Units (Through a unique Carbon Credit Program) to families in Kenya... That translates into 4.5 million people with clean drinking water! When you buy any of their high quality products, You are supporting a company that is truly making a difference in third world countries! The Lifesaver Jerrycan is not cheap, but it is the best and "SAFEST" water filtration system you can buy for the money!